Lahore-based artist Imran Qureshi has honored Pakistan in Berlin , Germany by achieving the Deutsche Bank’s Artist of the Year 2013 Award there for his creative artwork. 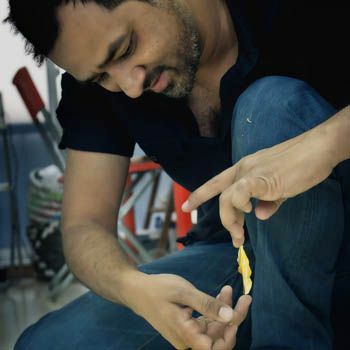 Imran Qureshi has become one of the important figures of Pakistan for winning the title of Deutsche Bank’s Artist of the Year 2013. The award is given to promising artists who endeavor for creating innovative artistic designs and concentrate on the two focal points of the Deutsche Bank Collection: works on paper, and photography. On the recommendation of Deutsche Bank’s Global Art Advisory Council, consisting of the internationally-renowned curators OkwuiEnwezor, HouHanru, UdoKittelmann, and Victoria Noorthoorn, the award was announced in Berlin in the name of Imran Qureshi. Moreover, Imran Qureshi’s works will also be shown in a major solo presentation at the Deutsche Bank KunstHalle in spring 2013. We wish Imran Qureshi many congratulation for making Pakistan proud at Deutsche Bank.